More to Mumbles Head than meets the eye! It's time for a rather belated update covering our afternoon activities following the visit to the Kittiwake colony in the last post. For the first time ever I found myself at Mumbles just as the tide was starting to get low enough to uncover the rocks between the mainland and the furthest island where the lighthouse sits. I have always wanted to get over there to explore the WW2 remnants as they look fascinating and quite extensive from my somewhat distant views. As it turns out they were even better than I had expected with a sunken railway, a new shipwreck and plenty of structures to walk around. I shall leave that for another post however and focus on the wildlife here instead. I am not afraid to admit that the very first time I visited Mumbles I was less than impressed and very nearly wrote it off as somewhere I would not return to. Regular readers will realise that this has been far from the case recently with the area proving to be one of the best for pretty much guaranteed bird photography. This visit was to be no different. Being out on the rocks allowed me to get a slightly different view of the Kittiwakes showing how extensive the colony is. The photograph below is a panorama made from three shots and shows the opposite side to the one I usually view. 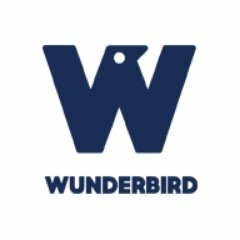 These birds are usually out of sight as the wooden decking on the pier has completely rotted away making access impossible. 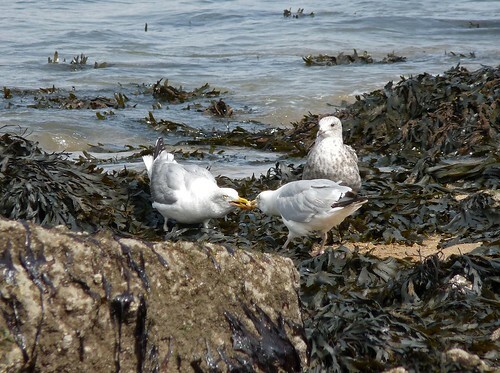 As we headed further out to the lighthouse there were several Herring Gulls which proved to be unusually tame. Unless in a car park these birds are often in the air as soon as you approach so getting a couple of behavioural shots in a natural setting was very nice indeed. 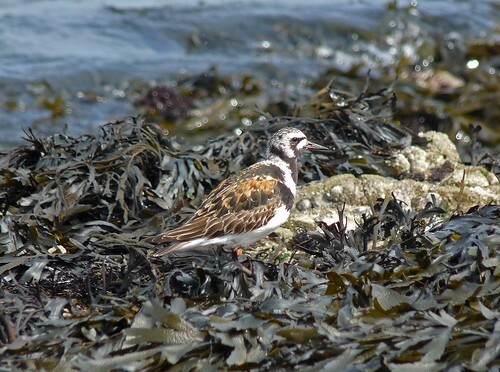 Also on the rocks was a group of twenty or so Turnstones. These are another regular fixture in the area and I have spent many hours being given the run around by them as I try to approach within range. 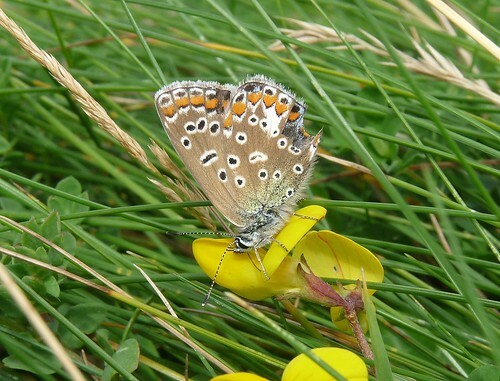 On the outer head, despite the relatively strong wind that had picked up, there were several species of butterfly on the wing. 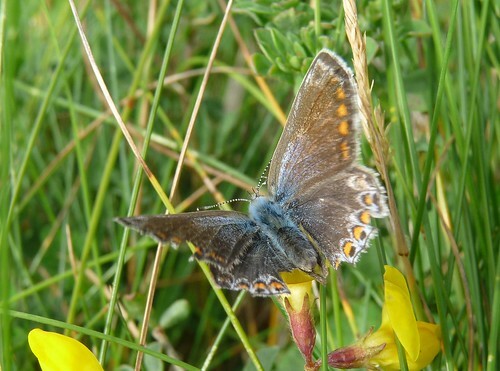 One that particularly caught my eye was this pristine Common Blue. It was very obliging and allowed me to get shots of both its upper and under wings. 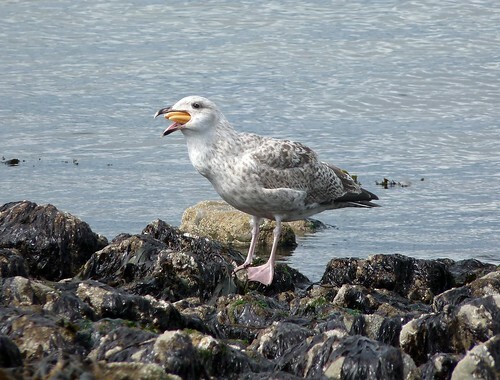 I have saved the best for last though as on our return trip from the island we noticed that the Herring Gulls were being more argumentative than usual. 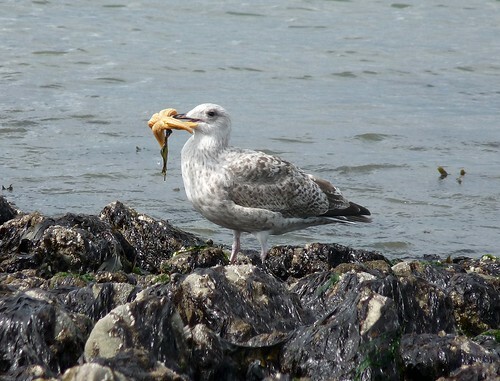 The reason quickly became clear as an adult bird flew overhead with a huge Starfish in its beak! A quick scan across the water revealed that the gulls were sticking their heads beneath the surface and coming back up with masses of starfish. I have never seen this behaviour before and prior to today hadn't even seen a Starfish in the area. 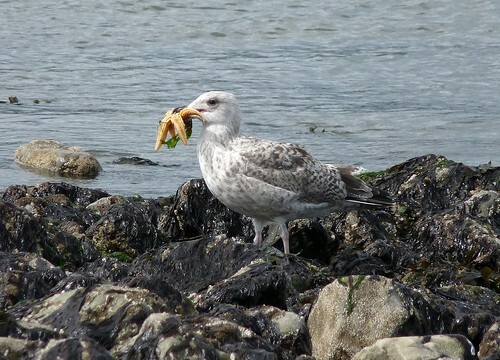 I spotted a juvenile bird close by and got the following series of shots as it devoured its latest catch. I have no idea what they taste like but the birds certainly weren't bothering with any chewing. It was very much a case of down the hatch in one gulp, despite the Starfish's best efforts to keep themselves rigid with legs outstretched. Inevitably this abundance of food caused several disputes to break out. Each bird that came up from under the water with a fresh catch found itself very quickly mobbed by the rest of the group. The two below were so engrossed in their tug of war that they were oblivious to the goings on around them. I think the third bird is just waiting until the others tire themselves out so that it can nip in and take the prize. Also in the area were three Ravens soaring over Bracelet Bay. I so enjoyed this post. We saw our first 'Gower' starfish during the May Bank Hol. at Caswell. 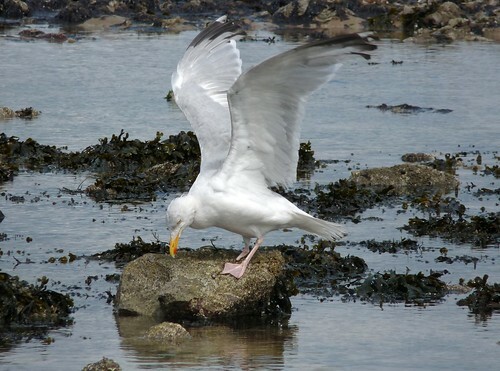 Never knew gulls ate them whole! Shots for a competition ... ? Glad you enjoyed it Caroline. I've no idea how common this feeding behaviour is or if it could be a localised thing due to the availability of the food? Pen Y Fan - I've got your number!